Looks like the history “teacher” needs to learn the history of our country and our Constitution! Here in the US of A, we have FREEDOM of SPEECH (expression) and the Right to Bear Arms!!! A history teacher sent one student to the principal’s office and lectured another on the evils of guns, for wearing a T-shirt advertising the National Rifle Association. 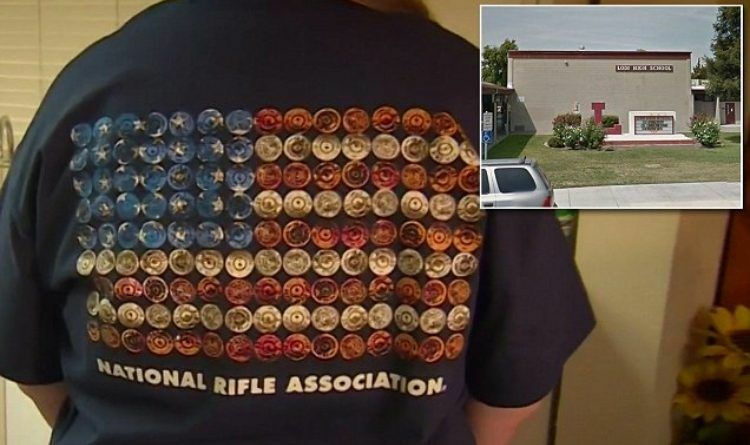 Last Friday, the teacher at California’s Lodi Unified School District lectured two teens about why guns are bad after they both wore NRA shirts. Charlene Craig told the news outlet that both her 15-year-old daughter and another student refused to remove their NRA shirts and that the second student was subsequently sent to the principal’s office. The school’s administration reviewed the shirt in question and found that it didn’t violate the Lodi Unified School District’s dress code. The school district also reportedly plans to re-inform its staff about dress code policies. Since when do teacher have the right to remove a student from class over clothes? The teacher is certainly entitled to his/her beliefs but so is the student. The teacher has NO RIGHT imposing his/her feelings on the student. Supposing that was the only clean shirt the kid had for the day? But not have been the best choice but could have been his only choice. What if he came with no shirt? If the dress code does not cover words and pictures then they have no leg to stand on either he wears it or all church with pictures and words get stricken from the school.